First Line: " It takes guts to deliberately mutilate your hand while operating a blister pack sealing machine, but all I had going for me was guts." 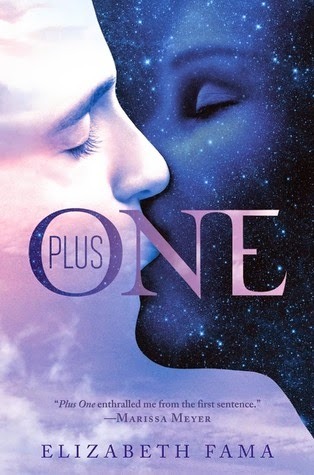 Review: I love the cover to Plus One I think it represents the world which was created perfectly. I just had really high expectations and felt when it came to the world building it should have been detailed out a little bit more to where I could have believed that something like that could really happen. As far as the main characters go I liked Sol and D'Arcy. I loved Sol's loyalty and love for her grandfather. She was a very impulsive person but when it came to her grandfather she didn't care what risks she had to take to bring him happiness and I really admired that about her. As far as D'Arcy, i'm not going to lie I did not like him in the beginning mainly because of his actions but as we got to know him better I liked him more and more and then when the romance happened and we find out who he really is I adored him that much more. Speaking of romance lets just say the two hated each other from the beginning but in the book there are flashbacks to Sol's past and the two have a past together they just don't know it till later. As far as the plot goes it starts off with Sol trying to go steal her brother's baby and yes she has plans to put the baby back once her dying grandfather holds it, anyways things don't go as planned and it gets pretty crazy after that. There are quite a few conspiracies that transpire and obviously kidnappings but eventually it felt like a big circus like there was way too much going on and at times not believable at all. Then there was the ending, I believe this is a stand alone so thumbs up for that but it was a very open-ended conclusion and I kind of wished for more. Overall even though it seems like I had more negative then positive things to say about Plus One I still enjoyed it and I think mainly it was because of Sol and D'Arcy and Fama's writing was actually very beautiful. Memorable Quotes: ~ " You don't need to "matter" in the world, because you already matter to the only person who counts."